As a cloud solution, NetSuite OneWorld is easy and quick to deploy. Compared to other ERP systems, you can deploy NetSuite OneWorld in 90% less time. With NetSuite OneWorld, you have anytime, anywhere access that supports all users on the go, no matter where they are. NetSuite OneWorld also provides real-time access to organizations that have global services pools and multi-currency, subsidiary, taxation, and language requirements. Over 16,000 midsized and high-growth companies, as well as divisions of large enterprises, use NetSuite to run their business. NetSuite’s ERP software is also applicable to any industry type. Their customers range from insurance providers to retail restaurant chains to online retailers, demonstrating the flexibility of their solution. NetSuite OneWorld is an on-demand business ERP software system that delivers real-time business-wide management and global financial consolidation tools for mid-sized companies that have multi-subsidiary and multinational operations. With NetSuite OneWorld, users can supervise companies with various subsidiaries, legal entities, and business units—all from one NetSuite account. NetSuite OneWorld gives employees all over the world the functionality, tools, and information they need in order to manage their whole business better and easier, all while streamlining operations. NetSuite OneWorld handles different taxation rules, currencies, and reporting requirements—all at a small portion of the usual cost of on-premise ERP solutions. It is an all encompassing system that includes both ERP and CRM functionality, tailored for user- and company-specific business needs. NetSuite was founded in 1998 and has its headquarters in San Mateo, CA — right in the heart of Silicon Valley. Its nine offices span the globe, with locations in Europe, Canada, Australia, and Asia. Gartner named NetSuite one of the top 10 the fastest growing financial management solution, and they’ve received four CODiE Awards from the Software and Information Industry Association in the past two years. $10K/year minimum to subscribe to NetSuite solutions. Users report unhappiness with NetSuite’s support. 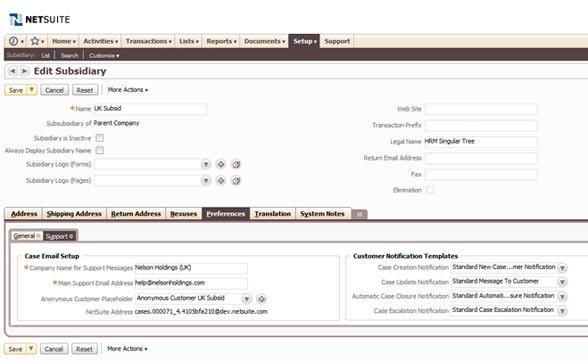 Strong ERP features, but could use more fleshing out in the CRM module. Lacks Manufacturing/Supply Chain/Logistics ERP features. NetSuite OneWorld is for mid-sized companies that have multi-subsidiary and multinational operations, and it can be configured to manage all of your legal entities and business units from one NetSuite account. OneWorld rolls up multi-currency forecasts across multi-national sales organizations, permitting sales staff to manage orders and forecasts against quota in their local currency, while providing headquarters consolidated figures in the base currency. Similarly, dashboards can display roll-ups of country specific business activities and results with full drill-down capabilities to the underlying records. OneWorld is a powerful module that is particularly well suited to global and multi-national businesses. However, though you save money on overhead, support costs for NetSuite solutions is pretty high since they only take on customers who will spend at least $10K/year. Additionally, users often report dissatisfaction with NetSuite’s support services. As far as the solution itself goes, it’s strong in financial consolidation and project management, but somewhat lacking in its CRM module. If you’re a manufacturer/distributor, you’ll have to add the modules you need for manufacturing, distribution, and supply chain/logistics. In any case, if your organization is relatively large, has multiple subsidiaries, and is shopping around for a tier 2 cloud system, then NetSuite OneWorld is a pretty good cloud alternative to legacy systems like Oracle or SAP. This paper, based on the experience and best practice established by early adopters, sets out a framework for deciding on and implementing on-demand ERP within enterprises of 250 employees or more, or in divisions within a larger enterprise. The paper will examine key concerns such as data integrity in enterprise systems, maintaining compliance and ensuring proper process management, as well as discussing new skills and approaches to help maximize returns on investment.